Measuring the ROI on investment in truck body aerodynamic applications is an excellent way to measure how much money a company is saving by using truck body aerodynamic applications on either part of their truck fleet or on their entire truck fleet. Truck body aerodynamic investments and applications can save a company a lot of money and many companies simply do not realize the very large amount of money to be saved by applying certain proven techniques to their trucks that make them more aerodynamic on the road. In the long, truck body aerodynamic applications can make a company a lot more money and increase its revenue by significantly lowering the overall cost of the fuel intake of its trucks. Every trucking company knows that lowering the amount of money spent on fuel for part of its fleet or for its entire fleet can help earn the company significantly more revenue. Calculating the return on investment, or ROI, for truck body aerodynamic applications is where a truck investment ROI calculator comes in. A truck investment ROI calculator is an easy to use and very effective tool to see how much more money a company is earning based on the usage of truck body aerodynamic applications. 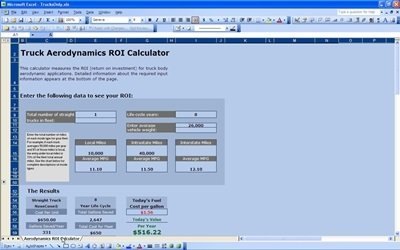 An ROI calculator use a system which makes it easy to input key information for the calculator. This information is key to getting a good and accurate ROI information result from the calculator. Once the information is put in, the truck investment ROI calculator will deliver the information on the ROI for truck body aerodynamic applications. The amount of money that a company can save with truck body aerodynamic applications is truly incredible and this ROI calculator can help a company realize exactly how much money they are saving or could be saving with these very effective applications.